Tea has numerous health benefits. Whether it's black, green, white or red – tea can benefit your health and beauty in so many ways. I was excited to be asked to attend Lipton first tea-inspired Masterclass last week. 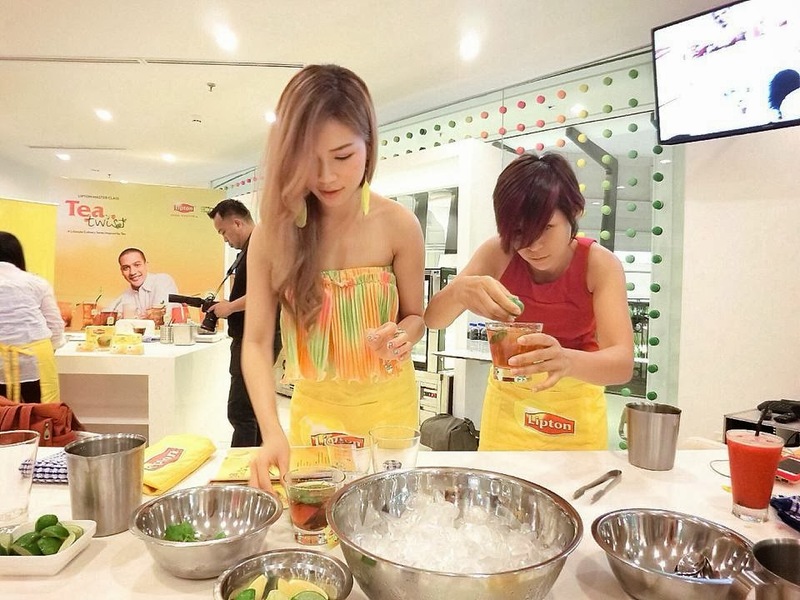 The event was held on 5 of December, held at Starhill culinary art studio, Kuala Lumpur. Lesson learnt, Tea is not just teabag and hot water! hahahaha. Keep reading to see all the ways we learnt to turn our tea to lively glass of refreshment. 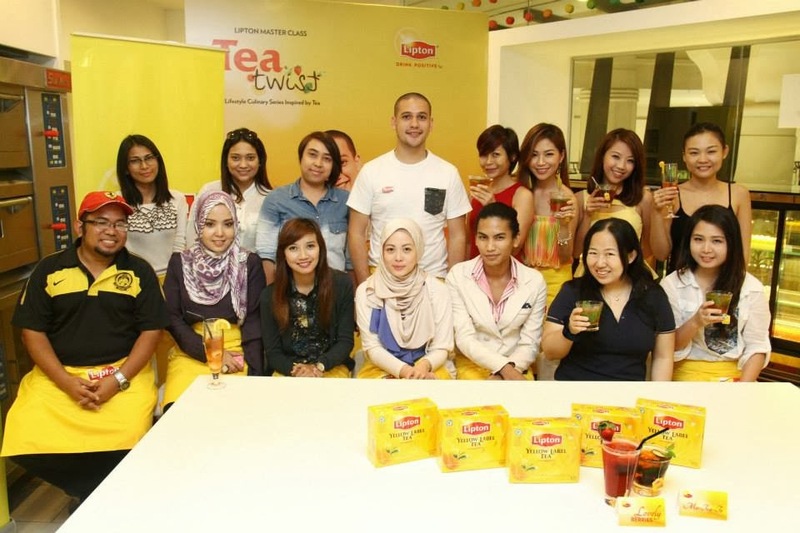 Thank you Chef Nik for giving us all the creative transformation of a teabag! Malaysian Celebrity Chef Nik demonstrated four new tea drinks and a tea inspired appetizer using the LIPTON YELLOW LABEL teabags. Overall, the event was interesting. We were presented with some new and refreshing ways to prepare tea. The session started off with Chef Nik doing a cooking demonstration and he made it look so easy! He made Tea Crusted Prawns with salsa on the side. Lipton tea was added to the recipe in such a surprising way! Never thought tea bag can be used in that way.. He cut the iconic Lipton tea bag open and added a dash of it to the flour that would make the batter of the prawn This added a very unique flavour to the prawns which was balanced off with the fruity salsa very nicely! I'm one of the lucky blogger who get to taste it. It was really delicious. After the mouth-watering appetizer, Tea-Crusted Prawn.. all of us get to make the drinks ourselves. Each of us got the opportunity to create our own drinks as Chef Nik demonstrated it at the front. It was like a cooking class i used to watched on the tv! LOL! I love cooking, I couldn't wait to be Chef for the Day, so we all put on our Lipton aprons and started experimenting! The first recipe we all did together was the Honey Lemon Grass tea and it was super easy to make! We used lemongrass water (easily made with crushed and boiled lemongrass) and added the Lipton tea bad to the water. With a bit of some honey's sweetness, the tea came out so refreshing, and with the lemongrass flavour, it felt like such an exotic drink. A really unique perspective of tea, I must say. Here's a photo of Yours truly & RebeccaSaw busy making drinks like a pro. Apparently, we are housewife material. LOL! In fact, Tea is a very compatible and flexible drink, and it is amazing how well tea works with many great flavors. 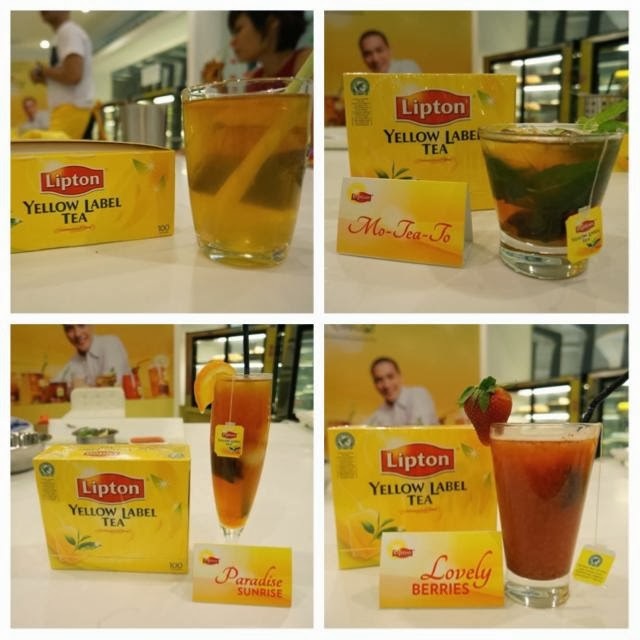 With just a few simple ingredients that can be found in most kitchens and of course LIPTON YELLOW LABEL teabags, we get to create our own refreshing, delicious and relaxing drinks. All the plain tea transformed and elevate in a whole different way. 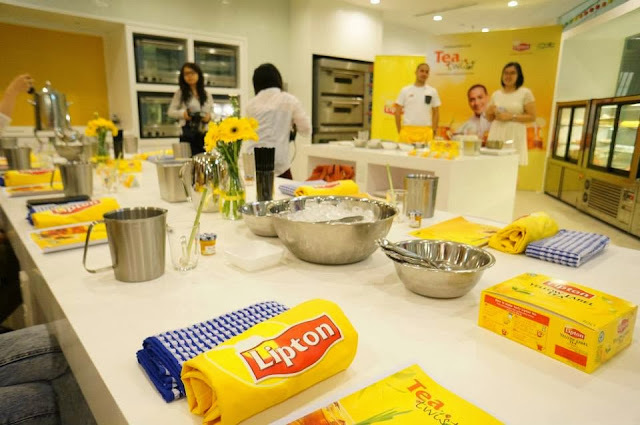 The previous thought of plain and classic tea can be wiped away, because Lipton tea bags now allows you to create various taste for you to enjoy. This was honestly so fun to be made and really quick to do as it took me only about 3 minutes to whip up this drink that's perfect for a hot day! The quality, taste, is compatible with a tea that served in high class restaurants and etc. Here's a few tea twist recipes we tried that day. The first recipe we all did together was the Honey Lemon Grass tea and it was super easy to make! We used lemongrass water (easily made with crushed and boiled lemongrass) and added the Lipton tea bag to the water. With a bit of some honey's sweetness, the tea came out so refreshing, and with the lemongrass flavour, it felt like such an exotic drink. A really unique perspective of tea, I must say. - Add some ice to chill the tea mixture, then add in orange juice and lychee juice. Stir well. - Garnish with orange slices and lychee pieces. Ingredients : 1 Lipton Label Teabag, 2 Tablespoons Sugar, 6 medium sized Strawberries, 1 tablespoon freshly squeezed lemon juice, 100 ml water, ice cubes. - Separately, steep teabag for 5 minutes in hot water, squeeze & discard. - Add in 3 tablespoon of strawberry concentrate followed by lemon juice & stir well. This was really nice and refreshing suitable for serving your guests at Christmas! - Pour tea into glass filled with ice, followed by lime juice and stir well. It's easy to make, just a few simple steps, great idea for any day, any time, any occasion. Not only is tea a tasty drink to enjoy, the health benefits are being increasingly recognized. 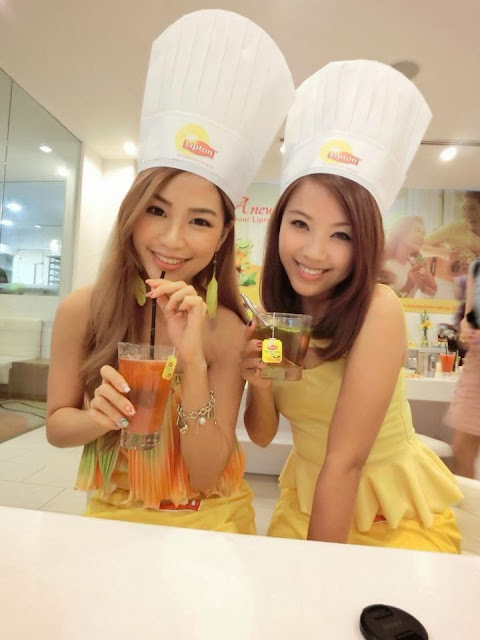 What a coincidence, our outfits matches LIPTON. LOL! 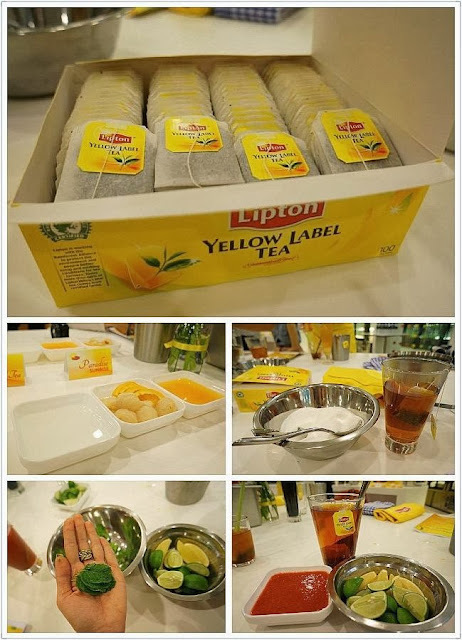 I really enjoyed the Lipton tea making session with the bloggers. It gave me a very refreshing perspective on making tea, instead of the usual plain flavours that we know. It made me realise the different functions of tea, even in cooking which is to add flavours. I am excited to try out the recipes at home and maybe even come up with new ones on my own! Last but not least, a group photo of the media with Chef Nik.